Cherry blossoms surround a statue of the Mary and baby Jesus outside St. Thomas More Church in Brighton, N.Y.
As someone with a particularly active devotion to Mary, I look forward to the beginning of May every year. 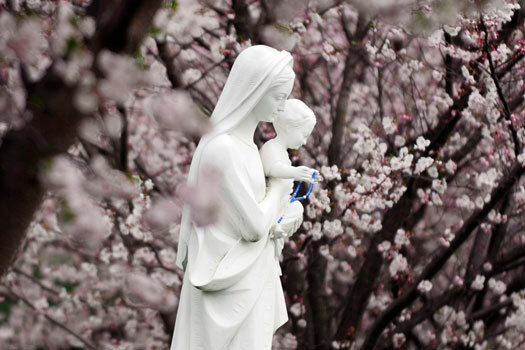 The Church has commended the practice of a month of Marian devotion during May for centuries. We celebrate Mary as the mother of Christ — of Life that overflows and saturates and renews the whole world — and we celebrate Mary as our own Blessed Mother — the mother of every single one of us who envelopes us in her dynamic love and fervent protection. In May, we let ourselves become overcome with admiration for our Mother so that we might begin to imitate her. We imitate her so that we might love God more fully, more recklessly, more courageously. We strive to be passionate lovers of God so we might attain excellence in our love for each other. We strive for excellence in love because this world needs it … and desperately. Our month of Marian devotion is our school of love and justice. We need only sit at our Mother’s feet and learn. Hail Mary: A short prayer based largely on passages from Luke. Memorare: Attributed to Fr. Claude Bernard, a priest living at the end of the 17th century who did ministry with prisoners condemned to death. Salve Regina: Celebrating Mary as Queen of heaven and earth. The May Magnificat by Gerard Manley Hopkins: Something quite exquisite if not a little unconventional. Whether you are a longtime admirer of Mary or completely new to Marian devotion, there’s a prayer for you (see sidebar). When we pray them we are asking for her intercession on our behalf and on behalf of our communities and our world. We are praying with Mary as opposed to praying to Mary. We do so because we trust her, because her trust in God is perfect. We do so because we know she will give voice to the hopes, the sorrows, and the burdens that we carry but cannot put into words. She prays with us and through us when we haven’t the strength to pray for ourselves. During the Victorian era, the European tradition of May baskets snuck across the Atlantic for a few splendid years. The May basket was to be filled with flowers and small treats and left hanging from the doorknob of neighbors and sweethearts. The object was to leave your gift anonymously and without being discovered in the act. Renew this lovely tradition but do it with a Marian twist. In honor of Our Lady’s month and her solidarity with the poor, suffering, and vulnerable, make one for someone in need — a single parent, someone who is grieving, someone who lost their job, or an elderly person who is lonely. Fill the basket with flowers, fresh produce from your local farmers market, a loaf of bread, a gift card to your local grocery store, a book of poems, a picture of the Blessed Mother, diapers — be creative! Every year on the first of May our little ones march into the backyard to make a crown for “Mama Mary.” We use honeysuckles because they grow (prolifically, I might add) around our fence. Traditionally roses are used, but I like to think the sweetness and wildness of the honeysuckles placed so lovingly on her statue in the middle of our overgrown vegetable garden make for an equally regal coronation. We crown Mary to show honor and affection for our Queen — the poor teenage girl living in a small village in an occupied country chosen to be the Mother of God and who gave her consent to tend to the unfurling of great untamable Love. We crown her in May because, in the midst of a month that resounds with the million little blossoming, hatching, sprouting “yes’s” nature is pleased to make to her Creator, Mary stands as our model of the million little “yes’s” we are called to make to God. If you don’t have any Marian statues, go ahead and break out the crayons. (I won’t tell.) Crown her on your fridge. Let it be a daily reminder of what you find true and beautiful and admirable. Then go out into the world and be those things with all of your heart and all of your soul and all of your mind and all of your strength. Your Queen — the Mother of Jesus, Incarnate Love and Justice — commands you. It is no coincidence that Mother’s Day falls on the second Sunday of May. We celebrate the goodness born of springtime and of ultimate Goodness born of Mary and the goodness we receive from our own mothers. This year, in honor of Mary, honor all mothers. 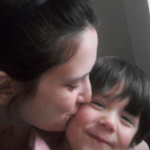 Help a mother struggling with groceries and small children to her car. Look through your closet for professional attire you could donate to a women’s shelter to give a mother a chance at a new job and a new life for her family. Visit an elderly relative, friend, or neighbor who is widowed or lives on her own. Donate to a charity that promotes small, woman-owned businesses in the developing world. Smile the next time you see a pregnant teenager on the bus or in the mall or behind the counter at your favorite fast food chain. Congratulate her. Ask her if she could use a few things for her baby. She has a perilous journey ahead of her. She needs kindness and affirmation. Not judgment. Honor them all. Honor the ones that are all too often forgotten. Caitlin Kennell Kim is a full-time baby wrangler, writer, and ponderer of all things theological. She earned her Masters of Divinity in Pastoral Ministry and Theology from Union Theological Seminary in New York City. She currently lives in Northeast Ohio with her husband and their four small children.